The supply of water and sanitation are fundamental to the development of societies. Examples from history - for instance, from ancient Greece - reveal cases where the preservation of the purity of water from a profane and a cult perspective was legally regulated. Every person is entitled to water and sanitation from the moment of birth, at any time and without any restrictions. These rights are derived from the United Nations International Covenant on Economic, Social and Cultural Rights adopted in 1966. Even though the rights to water and sanitation are not explicitly mentioned, the UN Committee on Economic, Social and Cultural Rights decided in 2002 that the rights are inherently included in the right to an adequate standard of living. In doing so the Committee specified the content of the right to water and sanitation – then perceived as one right – while also formulating the associated state obligations required for its implementation. The content of the rights to water and sanitation and its implications are specified in General Comment No. 15 of the UN Committee. The definition of the five core elements of these human rights was a landmark: availability, accessibility, quality, acceptability and affordability. For the first time, in 2008, the United Nations appointed an Independent Expert on these human rights, who was later transformed into a Special Rapporteur. This Special Rapporteur’s task is , inter alia, to identify examples of good practice and promote further specification of the content of the rights. In 2010, both the UN General Assembly and the UN Human Rights Council explicitly recognized the human right to water and sanitation. Both resolutions referred to the right to water and sanitation as one human right. This was changed in 2015, when the General Assembly adopted a resolution brought forward by Germany and Spain, recognizing water and sanitation as two distinct rights. While these rights remain closely related and are both derived from the right to an adequate standard of living, the separation is intended to – inter alia – increase attention to the neglected issue of sanitation. Sustainable Development Goal (SDG) 6 of the 2030 Agenda for Sustainable Development stipulates that by 2030 every person worldwide should have access to adequate and equitable sanitation and hygiene. Not only should nobody have to defecate in the open, but people should have access to functioning, adequate sanitation systems. Regarding sanitation particular attention should be paid to the issues women and girls face when adequate sanitation and hygiene are lacking. The human rights to water and sanitation are universally recognized – but implementing them remains challenging: Still 663 million people lack access to improved drinking water sources likely to deliver safe drinking water. 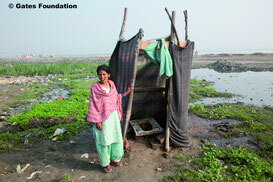 2.5 billion people lack access to improved sanitation. Every year, more children die of diseases caused by lack of safe water and sanitation than of malaria, measles and AIDS combined. Realizing safe water and sanitation services is among the great challenges of our time. At the same time, notable progress has been made. Even where the supply with water is not always reliable, the target of the Millennium Development Goal on drinking water of halving the number of people without access to improved drinking water between 2000 and 2015 was met already in 2012. And even though the Millennium Development Goal on sanitation was missed, 2.1 billion people have gained access to improved sanitation. However, there are blatant disparities: For example, in 2015, only 4% of city populations lacked access to improved drinking water sources, compared to 16% of the rural population. The disparity in relation to sanitation is even wider: While improved sanitation is available to 82% of city dwellers, this applies to only 50% of the rural population.